Extracts from a talk by Oliver Baker, City Care, to the Glenside Progressive Assn. Inc , 15 July 2013 about interesting findings discovered during the restoration of The Halfway House. 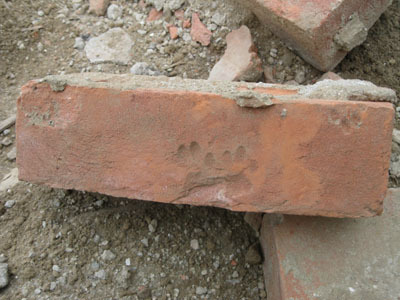 Cat paws in the bricks were found when the chimneys were deconstructed. Mortar on the bricks was found to be earth. 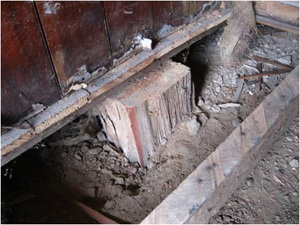 With floorboards up the piles were revealed. In many cases these were seen to be undressed pieces of tree, which was a common and pragmatic approach to piling often seen in 19th century houses. 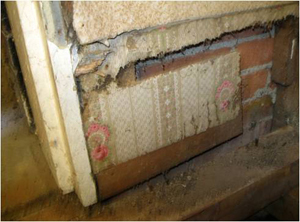 On close inspection the piles were found to be in poor condition, and most will be replaced. 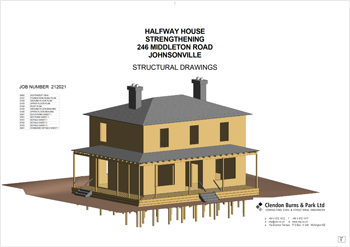 Their poor condition is possibly due to the fact that the ground beneath the house would be subject to damp from runoff from the adjacent steep hill, and the location of the house on a low stream valley. Original wallpaper was visible in some rooms, or occasionally with earlier paper revealed beneath the outer layer. Wallpaper can be a notable indication of both the use of the room (functional or public use). 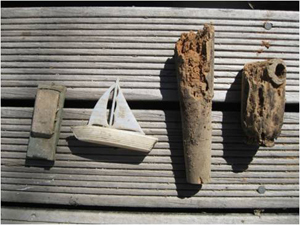 Toys were found in all spaces, including plastic construction sticks, plastic boats and cars, a ceramic tea set, marbles, tennis balls and other items. Of note was a cork doll's body and separated cork leg, found in the hallway. Copyright Glenside Progressive Association Inc © 2013. All Rights Reserved.